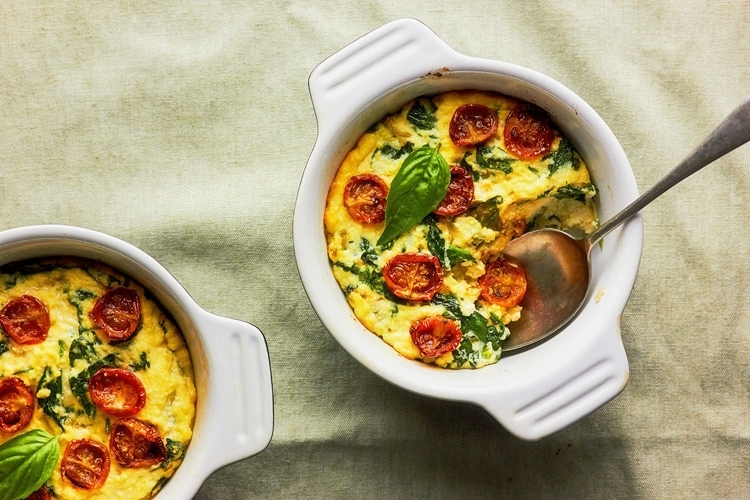 A sformato – its literal meaning is “unmoulded” – is a traditional Italian dish that sits somewhere between a soufflé, a baked custard and a crustless quiche. Happily, and in true Italian style, it’s faster and easier to make than all of those things. In Italy, you find sformati most commonly flavoured with pureed peas or potatoes, often cooked in a ring mould and served in slices or wedges. In my version, I use higher proportion of ricotta than is traditional and the result is less like a baked custard flan. It’s lighter, airier, fluffier. I fold in some wilted baby spinach leaves and top it with a few halved cherry tomatoes. More rustic, perhaps, but compellingly good to eat. You can, if you like, turn it out onto a plate, although I am much more likely bake it in a single dish and serve it up with a spoon, or bake in individual ramekins and present them on their own plates. It’s a very good, easy thing to whip up for lunch with a little leafy salad alongside, and is a simple, if slightly unorthodox, accompaniment to a plainly roasted chicken. While I have included cherry tomatoes below, you can leave them out completely if you want a nice twist on a creamed spinach side dish, in which case I’d recommend adding a grating of nutmeg to the mixture. If I have a tub of my semi-dried cherry tomatoes in the kitchen – the chances are always high – I’ll use them here and they are perfect. Set your oven to 200°C (400°F) and lightly butter one large (about 2-cup capacity) baking dish or 2 small (1-cup capacity) ramekins. Warm the olive oil in a broad, heavy-based pan over medium heat. Add the onion, chopped. Bruise the clove of garlic under the flat of a knife blade and add to the pan. Cook until the onion becomes soft and translucent. Chop the baby spinach leaves roughly if they are large and add to the onion, stirring for 30 seconds until wilted and cooked down. Remove from the heat and set aside to cool a little. Retrieve the garlic clove and discard. In a bowl, beat the eggs together with a fork. Add the ricotta and Parmesan, seasoning with salt and pepper. Stir in the spinach and spoon the mixture into your baking dish (or ramekins). Scatter over some halved cherry tomatoes and drizzle with a little olive oil. Bake for 20 minutes until set and lightly golden around the edges. Let it sit for 5-10 minutes before serving.